OK Google; what do I need to know about voice search? Comscore predicts that 50% of all searches will be voice searches by 2020. How can your business prepare for the inbound voice search revolution? Voice search is something that is now an integral part of many people’s everyday lives but just a few years ago it was little more that a gimmick. Remember way back in 2011 when Siri came out on the iPhone 4S? It seems like a lifetime ago in terms of technology. When it first came out, Siri was frustratingly bad and totally impractical to use. In 2011, iPhone users would laugh at the hilarity of the way Siri would interpret their requests; today however, according to Hubspot, 19% of iPhone users engage with Siri at least once a day. That’s almost 1 in 5 iPhone users daily using their voice assistant. So, if the voice search revolution is already well underway and more users are conducting voice searches, do your content marketing efforts need to change? 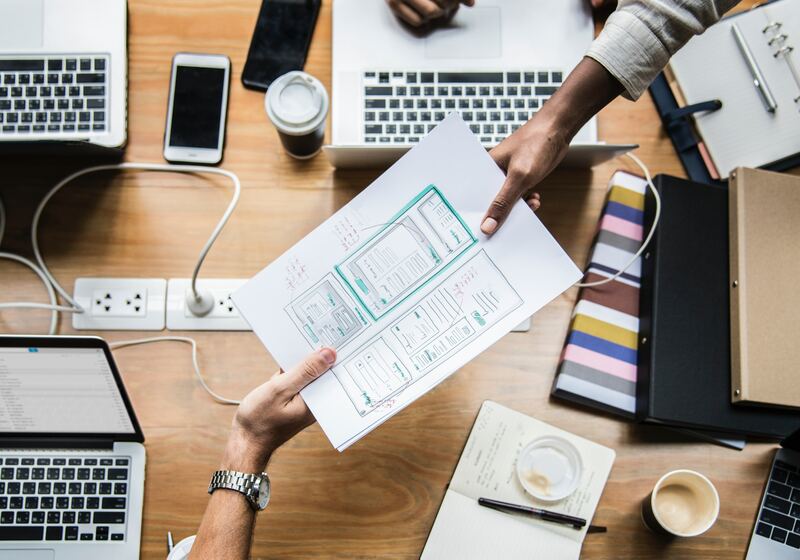 The thought of adopting new technologies and adapting to change can be overwhelming and some businesses had to be dragged kicking and screaming into the twenty first century and are now paying the price as they can’t meet consumer demand. Change can be scary but with it also comes opportunity. By incorporating voice search into your SEO strategies you provide a service your users want and put yourself ahead of your competitors. Why should you care about voice search? Brands need to be where their audience are if they want to be heard. It might seem obvious to point out but if your customers are using voice search, and your website is not optimised for voice search, you are going to have less visibility with your audience. Voice search is still an emerging technology but it is being embraced by consumers at a rapid pace. 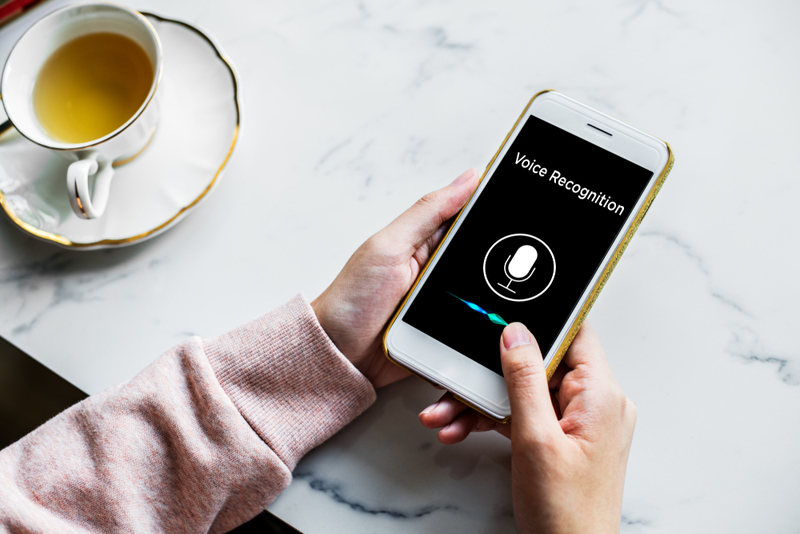 While at the moment, a lot of voice assistant may have a limited capacity, learning how to take advantage of them now will lessen your learning curve as the technology gains more applications, in addition to giving you an advantage of visibility over competitors who have not yet optimised for voice search. Is there a limitation to how much information you can answer a voice search with? 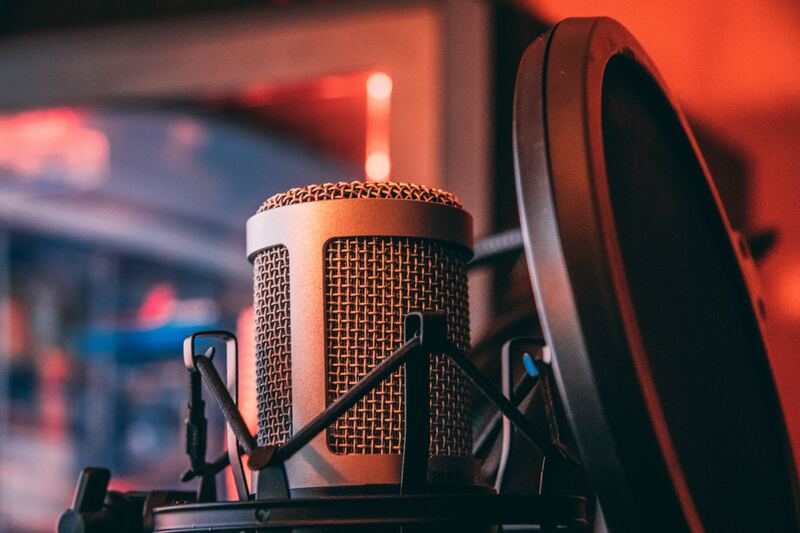 While some consider a pitfall of voice search the limitation to the amount of information you can respond with, as a brand you should look at this as an advantage. Type search on Google and other search engines can be overwhelming for users. They have to wade through a lot of results and it can be difficult for them to find the information they are looking for. Voice search can simplify this process, giving you the opportunity to give simple, clear and conversational answers to consumers. A consumer that types a query into Google will behave differently than a consumer that speaks to Google. According to More Visibility the average search through typing is around one to three words but voice searches are much longer, generally including seven or more words. You might not think this change in language is a significant difference but those few extra words provide more context and change the type of content that the user is searching for. By providing conversational content you can help give a richer answer that is more likely to lead to a conversion. According to Search Engine Watch voice searches are three times more likely to be locally-based than text searches. A user can have a full conversation with Google and go on to get attraction information or contact details and make a call without ever having to leave the search engine or visit a company’s site. As a result of this change in search behaviour it is more vital than ever for businesses to keep up to date profiles on sites like Google My Business. 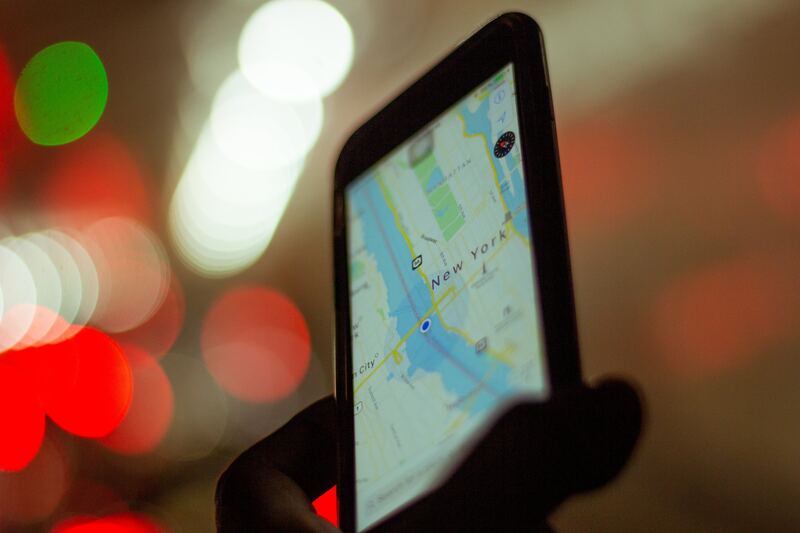 Having the correct information such as address, opening hours, phone number, website easily accessible through search results makes for a more seamless experience for users. 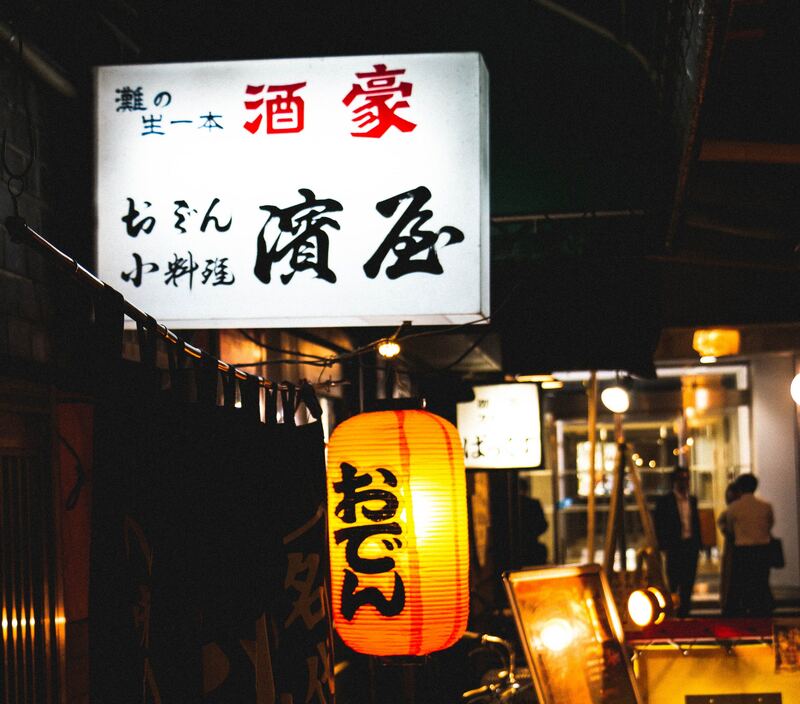 By having this information available within SERP’s business have a greater chance of getting offline conversions. Elongated search terms can help business of both local and enterprise level understand the users intent. Through text based search a user might type something like ‘camera shop,’ but this doesn’t tell you much about what the user is after. They might want to buy a camera, they might want to speak to someone and ask for advice regarding which type of camera they need, or they might be trying to find a shop that can repair their camera. A voice searcher will typically search in more complete sentences asking something like ‘Where can I buy a Nikon camera in Manchester?’ or ‘Camera sensor cleaner near me.’ If you are a smaller brand that struggles to rank for short and highly competitive search term, you might find that gearing your SEO strategy towards these longer voice search phrases and questions will give you better results. As content creators, when trying to create content that provides helpful answers to our audience, we not only think about the text but the way that it is displayed; incorporating visuals, layout and structure to ensure that it provides the most value to our audience. Voice search, unlike type search, has no visual interface though, meaning as creators we have to rethink the UX design. In the coming years we can expect to see voice commands turn UX design on its head in much the same way mobile touch screens did just a decade ago. Rather than thinking about UX design in terms of visuals we need to think about it in terms of how users digest information. Text will become the focal point of content and rather than creating a design with placeholder text, the choice of words will become the most important aspect. Virtual assistants have become more familiar to us and the likes of Siri, Alexa, Cortana and Google are now entwined in our lives. They make finding information easier and are more intuitive than type search, changing the way search engines operate and the way business present their information online. Local businesses are seeing a large impact from voice search and we can see that clearer search intent is leading to users to follow up with businesses, becoming leads and then possibly converting to customers. These stats make it clear that voice search optimisation should be a key marketing strategy in 2019 for any local business owner. In 2016, Amazon released its smart speaker, the Amazon Echo and sold 11 million units in that year. Smart speakers quickly became the hottest new trend in voice tech, so of course Apple and Google weren’t far behind in creating their rival devices; Apples HomePod and Google Home. Since then many smart speakers have launched smaller and more affordable versions to make them more accessible, meaning almost anyone can own one. Amazon now has the Echo Dot and Google the Home Mini and each can be purchased for under £30.00. 2018 research by YouGov found that one in ten people in the UK now owns a smart speaker and according to GeoMarketing, 65% of people who own an Amazon Echo or Google Home can’t imagine to going back to the days before they had a smart speaker; showing that this is clearly not a fad that’s going to pass. 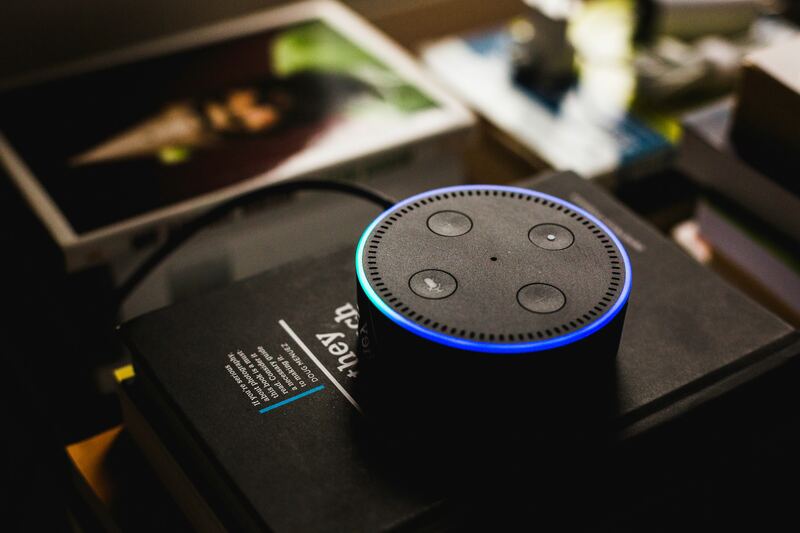 Speakers can provide a great opportunity for businesses as voicebot.ai and Verto Analytics research found that smart speaker owners used their devices much more frequently than smartphone owners; averaging 2.79 times per day in and 0.33 times comparatively. 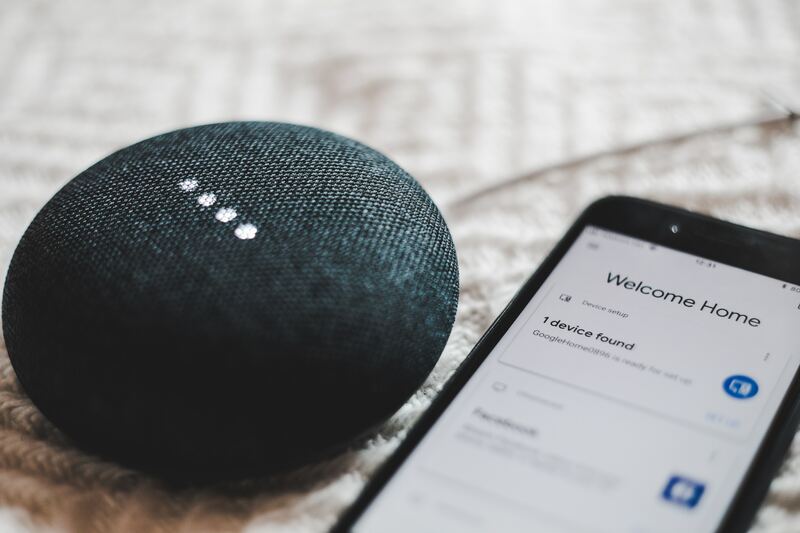 Voice search will predominantly be adopted by younger generations who are more adaptive to new technologies and will also have a big impact on local businesses. However, there are also specific industries that can expect to see a greater change in the way users find (or don’t find) their business as voice search becomes a more common. A thinkwithGoogle report found that there was a 2.1 times increase in mobile search for ‘stores open now’ and ‘food open now’ from 2015 – 2016 which can be linked the the rise of voice search on smartphones and smart speakers over this time. 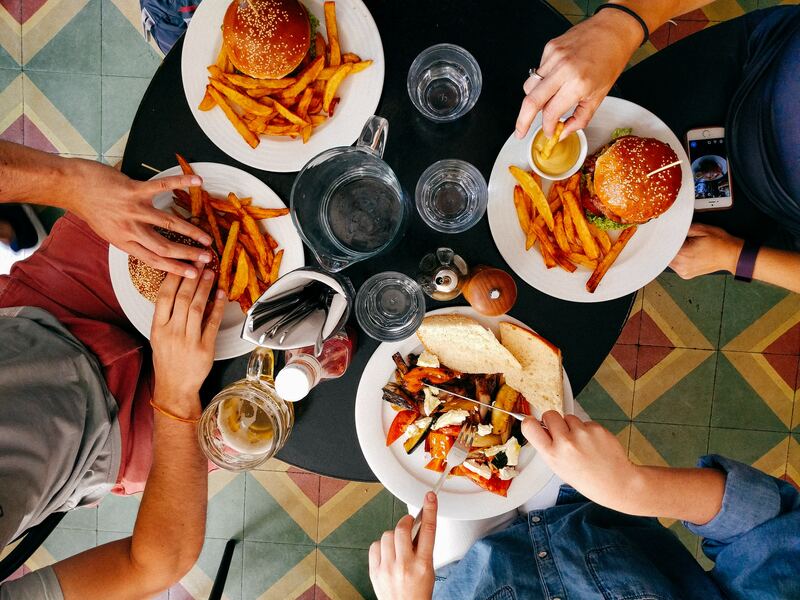 As users behaviour is changing through voice search industries like food/restaurants need to adapt their current search and SEO strategies if they want to maintain or grow their market share. If you have an international business, operating in countries like Korea, Japan or Greece where they have character based languages – that are much more time consuming to type than alphabet based languages – voice search will be key to you staying relevant in your market. We are likely to see an even more rapid adoption of voice search in these countries due to the convenience that it offers; saving users a huge amount of time over type searching, especially on mobile where keyboards are small and more difficult to operate with a language that has a larger number of characters. Are brands optimising for voice queries? The short answer is not really. Brands, although aware of the voice search revolution seem not to be focusing their marketing efforts in this area either because they don’t know what they need to do or because their competitors aren’t. This gives forward thinking brands an opportunity to get ahead of the curve and impress their audiences with voice search optimisation. How can you optimise for voice search? When creating content your main focus should be your audience, with that being said you also need to structure your content so that its optimised for search engines. Factors beyond your content help to determine a pages ranking in the SERPs and Schema markup is one that is highly relevant to voice search. Schema data is essentially meta data and is put into your sites source code. While it has no effect on what visitors see it, effect how search engines crawl your site and helps to organise and classify your content. When a user is making a voice search, especially something local, they are generally looking for something like opening times or directions and you can use schema markup to classify this information on your site so it is easy for Google to use it as an answer for voice search. If you search for the population of the United Kingdom, Google can give you a quick answer right in the SERPs because they can pull this information from World Banks due to their use of Schema markup. As we’ve already covered, a large amount of voice searches are local searches. By leveraging your Google My Business you can give your customers and easy way to find you and help Google provide accurate and up to date information about your business. You might have all your contact information on your site and think that that is enough to appear in local searches but its not the case. 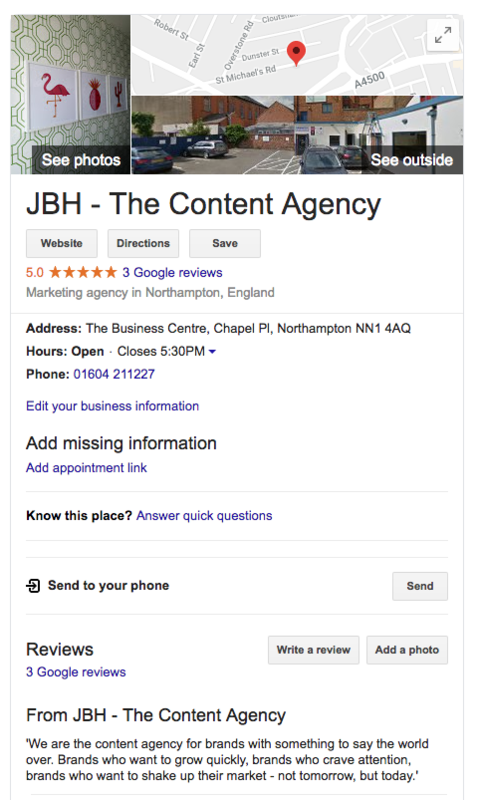 If someone searched for ‘Content Marketing Agency Northampton’ then having optimised your search for local keywords gives you a high chance of ranking for this term. However, if they searched for ‘Content Marketing Agency near me’ Google would be looking at the location of the user and use Google My Business listings to provide results. The vital elements to have included in your listing are your business name, address, phone number and opening hours. Beyond that it’s also a good idea to fill out the introduction field as it’s a great opportunity to pitch your business to the searcher. Voice search happens on the go so having a mobile friendly site is essential for voice optimisation. Your site needs to be responsive, giving users a seamless experience over desktop, mobile and tablet. With short attention spans you also need to prioritise your page load speeds, ideally getting them under 2 seconds to provide the best user experience and stop visitors going back to the search results after they have found your site. Voice responses from search engines tend to be pretty short – averaging around 26-35 words. If you want your content to be pulled for voice search responses you need information that is this concise. The current technology used for voice search does not give it the ability to crawl through a 1000 word blog post and pick out the vital bit of information a user is after so as a brand you need to think about short form content for voice search. Identify questions that users might be searching for and create an FAQ page with short, concise and informative answers. When it comes to voice search, it’s far from a one horse race. While the majority of the search market share is held by Google it is not the search engine of choice for all voice assistants. Siri, Google assistant, Alexa and Cortana are 4 of the biggest voice assistants but only 2 are powered by Google – Siri and Google Assistant. Alexa and Cortana are both powered by Bing. While a lot of SEOs measure success by their Google rankings, checking your Bing rankings is something that needs to be taken into account. With 20 million Amazon Echos sold, and their assistant Alexa powered by Bing, your brand needs to take into account your Bing results if you want to get in front of these users. As voice search answers questions without redirecting the user to a site you might think that it’s not going to be of benefit to your business however, there are a lot of advantages to incorporating voice search into your SEO strategy. Voice answers from stand alone devices like the Echo can help boost your brand awareness. With voice answers, unlike type answers there is no benefit to being in position 2. The search engine only has 1 answer to give rather than letting the user choose from the top results. By investing in being the brand that provides the best answers to voice questions you can have an edge over your competitors because the voice users is only going to come into contact with your answer. While voice searches do demand short answers, on mobile where a user has a screen device they can still result in click throughs to your website. Answers from featured snippets, which are primarily used for voice search answers, actually drive organic traffic beyond that of regular search results – especially on mobile where most voice searches are done. People talk at 150 words per minute but are only able to type at a fraction on that, averaging at 40 words a minute. Speaking is the more natural way for us to interact with our surrounding and search for information so as voice technology advances brands must prepare for the shift to voice search if they want to maintain and grow their market share. Learn everything you need to know about content marketing in our definitive guide. Are nofollow links worth your time and money?